August 27, 2015 by beWARM. For a pianist, long fingernails are an impossibility. When clicks are heard along with the music, out come the clippers. But once in a while, it feels so lovely – and indulgent – to have polished nails. Since I love to cook, my hands are water-drenched throughout the day – so my infrequent manicures have had a short and often traumatic life. Until I was introduced to the long lasting luxury of gel. Whoever dreamed that polish could withstand regular abuse, and last for weeks? And so, I indulged, before our daughter’s wedding, and a week at the beach. When it was obvious that the polish needed to be removed, I tried the usual remover. I realized I needed the heavy duty stuff. But even that didn’t work with just a cotton pad. 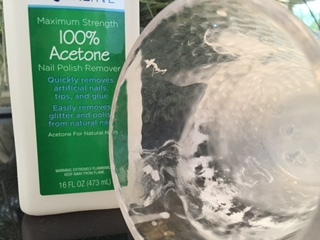 So I did what I have seen the professionals do – soak the nails. I just happened to use a plastic glass. The polish peeled off, all right. But the remover also ate the plastic. Horrified, I wondered what effect this toxic junk had on my body. It’s amazing that it didn’t eat away my skin. So while I’m thinking about the bodily dangers of harmful substances, what things should we steer clear of that can disintegrate our souls? …Anything that interferes with love, kindness, and compassion, for starters. And our minds…continually presented, sometimes invaded, with seemingly innocuous ideas and opportunities, that, left unchecked, can poison our attitudes and spread like a virus. We should be more mindful of the negative influences in our world. Much is published about toxic chemicals and their alarming effects. Less ink is given to mind and soul pollution. I guess it’s up to us to engage in our own crusade. No more gel manicures for me. And I am continuing to reinforce my shields that deflect less visible toxins. on August 27, 2015 at 10:43 am | Reply beWARM. Oh my….that’s another topic altogether! Daughters weddings, and the beach! My down falls as well. Gel it was for both, toes and hands, for me too. BIG MISTAKE. Feelings the same as my hands are ALWAYS in soapy or nasty water. Being a nurse, and a cook, both are harsh on the hands and toes! Rubbing them around in the word and painting HIS will on them are the answer. Who cares if we are in “Vogue”. on August 27, 2015 at 12:21 pm | Reply beWARM. LOVE the idea of rubbing them around in the word and adorning them with HIS will!!! Not sure who wrote this, but thank you so much for your wonderful thoughts!